SOUTH CHINA SEA - Seventh Fleet command flagship USS Blue Ridge (LCC 19) Sailors and embarked 7th Fleet staff members are preparing for humanitarian aid and disaster relief support operations while sailing toward the eastern coast of mainland Japan March 13. Blue Ridge Sailors loaded a humanitarian aid/disaster relief (HADR) kit while moored in Singapore Friday night and set sail Saturday morning. 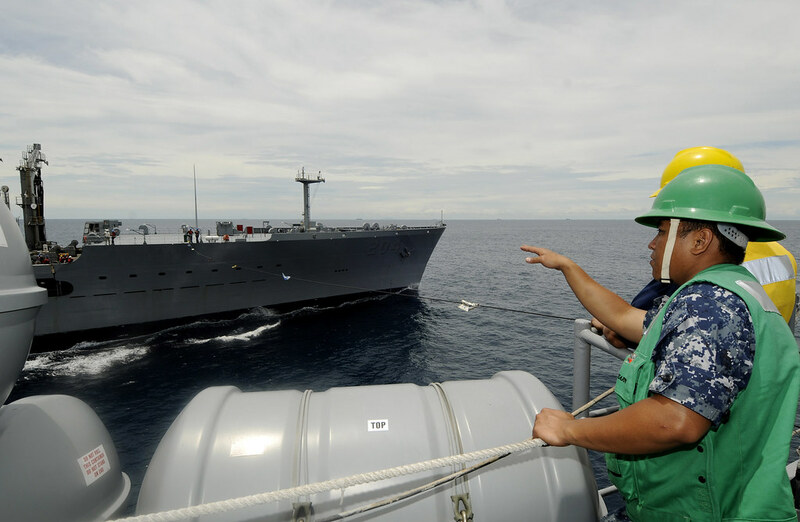 Shortly after departing Singapore, the ship completed replenishment-at-sea operations with USNS Rappahannock (T-AO 204), receiving fuel and additional supplies. Sailors worked past midnight Friday, loading equipment to allow Blue Ridge to provide fresh water and supplies during HADR support operations. “It’s giving me a sense of accomplishment to know that the work we’re doing could help people out,” said Fire Controlman 2nd Class Patrick Ramos, who helped push crates of supplies from the flight deck. Boatswain’s Mate 1st Class Jonathan Howton, a leading petty officer aboard Blue Ridge, has experience conducting HADR support operations in conditions similar to those location in Japan affected by the recent tsunami. USS Blue Ridge is uniquely equipped and able to perform amphibious command and control operations and is ready to support assigned HADR relief efforts.